If you have been using or want to use your iPad to do Keynote presentations, you may want to review the recent Apple knowledge base article Keynote for iPad: Best practices for creating a presentation on a Mac for use on an iPad. Your presentations will look best if you follow these tips. Use fonts common to both the Mac and iPad platforms. Fonts that are not available on the iPad are replaced with the Helvetica font. Open the image you want to convert to PNG. Use Adjust Size from the Tools menu to scale images to their intended size. From the File menu select Save As and then select the PNG option. If you need to use an image in a PDF format, use the Preview application to reduce the file size by Compressing your PDF files. 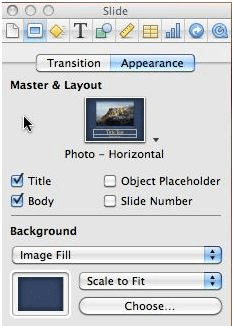 Do not override the theme backgrounds by making changes in the Slide Inspector’s Image Fill drop-down menu. 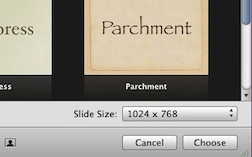 Keynote for Mac can reduce the size of images and videos to match their use on a slide and keep the presentation size to a minimum. It’s always a good idea to back up your document before using the Reduce File Size feature. To reduce the file size of an individual image that you’ve masked or resized to a smaller size, select the image and choose Format > Image > Reduce Image File Size. To reduce the sizes of all masked and resized (shrunk) images, and shortened videos, choose File > Reduce File Size. Is there a method for the other way around ..creating keynote on the ipad and need to email, says the file to big. Any way to reduce the overall size of the file even reduced PDF file size. Perhaps, using iCloud, you can pull up the same presentation on Keynote on your Mac. Once it is there, try reducing the file size and save it back to iCloud. Reese thanks to your iPad and see if the file size is reduced sufficiently. Of course, once you have reduced it on your Mac, you could email it from your Mac mail client.